Germany has been switching its power sources to renewable energy for years now, typically without incident. 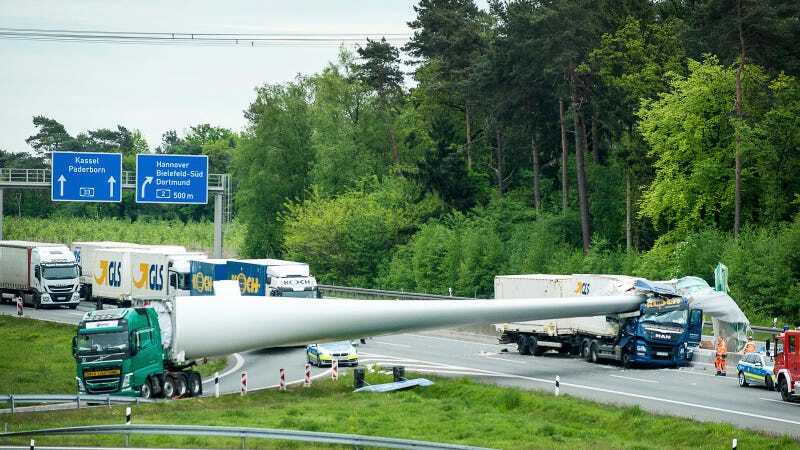 That changed Tuesday morning when a giant rogue wind turbine blade fell onto a lorry traveling along a German autobahn, shutting down traffic for hours in a seemingly desperate and radical attempt to reduce vehicle emissions. Ok, that last part is a joke, but a giant wind turbine was knocked down straight across a German roadway after its transport vehicle was involved in a crash, landing on a separate lorry and injuring the 61-year-old driver, according to The Telegraph. Images prove that it’s pretty amazing the lorry driver is even alive, as the mutli-ton white blade sliced almost directly into the driver’s cabin on the truck. 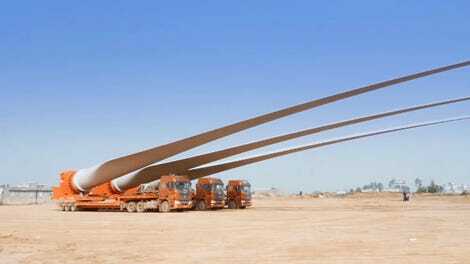 It’s unclear from the images and reports how exactly the enormous blade was being transported. Sometimes just one truck moves the blade, with it sticking forward from the back of the truck, out and over the transport cabin. Other transport methods include laying the blade flat over a multi-vehicle setup, with the back of the blade supported by a separate truck. Either way, the blade ended up across a major German autobahn and blocked traffic for enough time to suggest a global conspiracy to expand beyond just renewable resource energy alternatives, instead attacking emission directly at the source. Or maybe just the big thing hit the big car on the big road because of a small crash.